During my recent visit to Israel, Iran was one of the major topics of discussion. I spoke with political, military and intelligence officials about the threat posed by Iran's nuclear weapons program. The prevailing attitude about this threat was markedly different than my previous visit to Israel in late 2006. 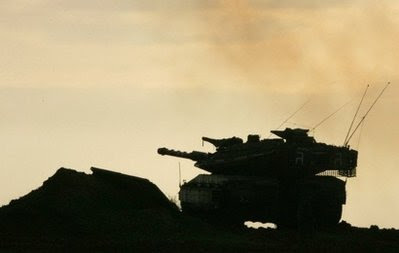 At that time, in the aftermath of the war in Lebanon, Iran was the main item of discussion on virtually everyone's agenda and was described in almost biblical terms as "the existential" threat to the state of Israel. While Israelis are rightfully concerned about Iran's potential acquisition of a nuclear weapon, they appear to have gathered more information on the Iranian program and put it into a slightly different perspective. Now they view Iran's program as "an" existential threat - there are more than one, including the Palestinian issue. While Iran is still the major threat to Israel, it was not the all-consuming issue it was in 2006. 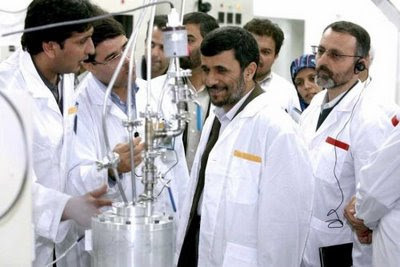 Israeli intelligence (Mossad) analysts believe that Iran will have amassed enough low-enriched uranium (LEU) that can be processed into sufficient highly-enriched uranium (HEU) for one nuclear weapon by the end of 2009. To begin processing the LEU into HEU required for a weapon, Iran will have to withdraw from the Non-Proliferation Treaty (NPT). Withdrawing from the NPT will erase any doubts about the true intentions of Iran's nuclear program. What are Israel's current options? Can something be done before Iran withdraws from the NPT? Is the military option the only option that will prevent Iran from acquiring a nuclear weapon? A coherent Israeli position is emerging. Almost all Israelis believe that the Iranians are the primary threat to the country and that deterrence is the preferred option. Failing deterrence, military action will be necessary. Successful military action against the Iranian program will be difficult, but the Israelis may believe they have no other option. According to Likud Knesset member Yuval Shteinitz, Iran will have a nuclear weapon within two years. 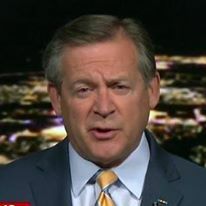 He favors telling the Iranians that if they do not cease their program by a certain date, military action is unavoidable. He believes this will be effective because the Iranians halted their program temporarily after the American invasion of Iraq - specifically the fall of Baghdad - since they thought they might be next. 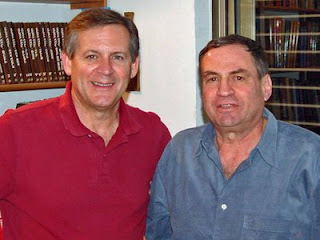 Former National Security Council Chairman Major General (Reserve) Uzi Dayan (with author in photo) favors sanctions on Iran as the initial means of pressuring Iran to stop their uranium enrichment program. In addition to a boycott on Iranian oil and prevention of imports of refined gasoline and diesel, Dayan proposes a maritime inspection protocol of vessels bound for Iranian ports. While that would likely be effective, the international community is too sensitive to Persian Gulf oil flows that support for such measures would be hard to gather. Quarantining ports is tantamount to an act of war. Since there is little international support for the level of sanctions required to ameliorate Iranian behavior, Dayan believes Israel must be prepared to execute a unilateral military strike on Iranian nuclear facilities. 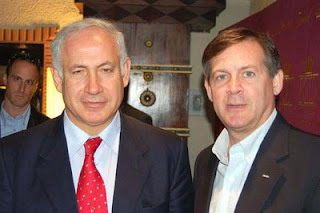 Likud leader Benjamin "Bibi" Netanyahu (with author in photo), currently the front runner to win the prime minister position in the February 10 elections, believes that Iran's acquisition of nuclear weapons is a greater threat to the world than the current economic crisis. He too favors a military option if the international community is unable or unwilling to solve the Iranian nuclear issue. Assuming Israel has decided on the military option, their prospects are not good. How will the aircraft fly from their bases in Israel to a target located 200 miles inside Iran? 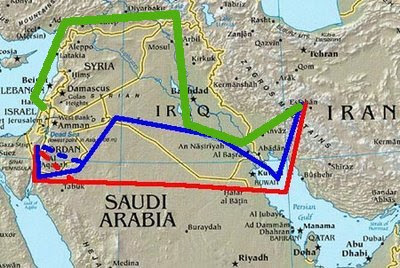 There are three possible ways to get there – either through Turkey (green), Saudi Arabia (red) or Iraq (blue), possibly a combination of all three, or even the use of Jordanian airspace as well. In any case, the route is a one-way trip of at least 1200 miles. Even though Turkey and Israel have had a defense agreement since 1996, Israel's recent actions in Gaza have soured their relationship with Turkey and may have jeopardized this option. Use of Turkish airspace lengthens the route, but keeps the aircraft in relatively friendly airspace the longest (assuming American-controlled Iraqi airspace is friendly), but requires American support with Iraqi airspace issues for Israeli refueling tankers, or the use of U.S. Air Force tankers. The question is, will Israel sit by as Iran develops a nuclear weapon? My guess is no. On my recent trip to Israel to assess the Israeli military operation in the Gaza Strip, I had the opportunity to talk to numerous Israelis and Palestinians about the situation in Gaza and the West Bank. I was hoping to hear insights on restarting the moribund peace process, particularly the Israel-Palestinian track. Most of what I heard was that for now at least, the two state solution is not an option. The new American envoy to the Middle East, George Mitchell, will face two sides agreeable only to a short-term ceasefire, but not agreeable to any long term solution. The major problem is that the Palestinians are divided - no one speaks for all the Palestinians. As the Israelis say, "We will send our proposals to the Palestinian side, but we need an address." An "address" that includes Hamas is unacceptable to the Israelis. The Israelis make a good point. The Palestinians have divided into many camps, the major ones of course being Hamas and Fatah under Palestinian Authority President Abu Mazin (Mahmud 'Abbas). Hamas claims that Abu Mazin's term expired earlier this month - he claims he remains as president until new elections are held. In the ceasefire talks in Cairo earlier this month, Hamas made it clear that Abu Mazin does not speak for them. One should not make the mistake of assuming that Hamas's influence is limited to the Gaza Strip - they are also very popular in the cities and towns of the West Bank. Many West Bank Palestinians, mostly secular in their political outlook, find themselves supporting Hamas not because they believe in the fundamentalist Islam of the group, but because they are disgusted with Fatah, the party of the late Yasir 'Arafat and current president Abu Mazin. The group is considered to be terribly corrupt. Fatah was supported by billions of dollars from the west, so 'Arafat built a casino in Ramallah. At the same time, Hamas, supported by millions of dollars from Iran, established charities, hospitals, orphanages and schools. In the 2006 elections in which Hamas won a majority, many Christian Palestinians voted for the Islamic Hamas to voice their opposition to Fatah. Given Hamas's refusal to recognize Israel's right to exist, their insistence that the ceasefire is not the prelude to a long-term peaceful resolution, their boast that they have already resumed importing weapons into the Gaza Strip and their claim that they have the "right to resist," it would appear that there is no reason for Israel to talk to them either directly or indirectly. A Hamas that will never agree to the existence of the state of Israel is hardly capable of being part of a permanent solution. 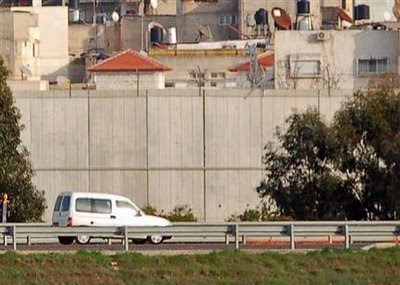 On the other side of the Palestinian divide is Fatah and the Palestinian Authority. The Palestinian people do not trust them, and there is no viable alternative. So it's Hamas or Fatah. Hamas and Israel cannot make peace, and the Palestinians have rejected Fatah. So for now, the Israeli position is that there is no solution, no "peace process." There may not even be a solution in the long term. The best they can do is manage the conflict. Truces (or "lulls" in Arabic) between the Palestinians as long as possible, military action when required. I do not envy Mr. Mitchell his task. From my recent visit to Sderot - The small city of Sderot, Israel sits just under three miles from the border with the Hamas-controlled Gaza Strip. 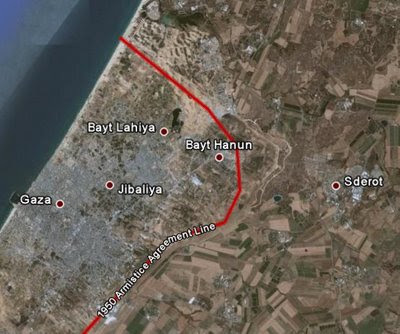 This places the city within the range of the homemade al-Qassam rocket, manufactured in the machine and welding shops in Gaza City, and launched from the strip of land south of Bayt Hanun and closest to Sderot. 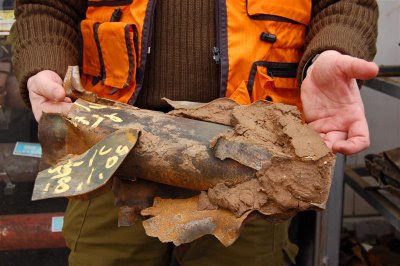 Since Israel dismantled its settlements in the Gaza Strip and withdrew its military forces in 2005, over 8000 al-Qassam rockets have been fired at Sderot. There have been 13 deaths attributed to the rockets. 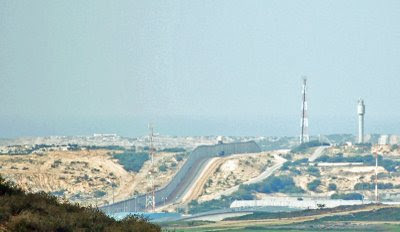 The photo shows three al-Qassam rockets being fired at Sderot, seen from Mitzneh hill in Sderot. Israel and Hamas had a temporary ceasefire (in Arabic, a hudnah, or "lull") in effect for six months - that ended in December. Immediately after the truce expired, Hamas began firing dozens of al-Qassam rockets into Sderot every day. Life reverted to the pre-truce days of running for safe rooms and public shelters. The precast shelter above sits next to a parking lot and school. 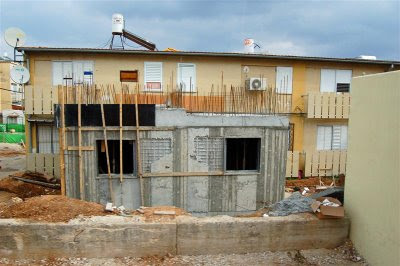 All new homes in Israel are required to have air-tight reinforced shelters. Many existing structures, especially in areas with Hamas rocket range are being refitted with safe rooms. 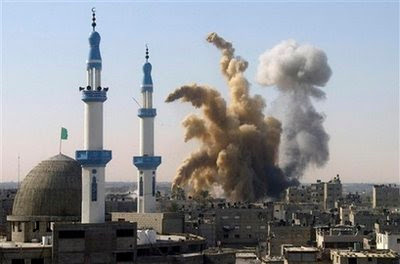 Once the launch of an al-Qassam is detected, a warning is issued over loudspeakers thoughout the town of 20,000 people. 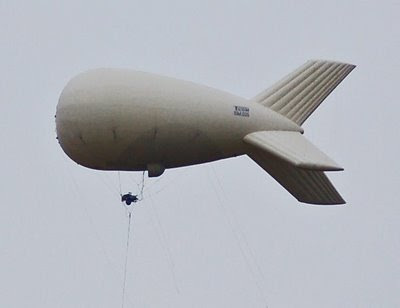 There are multiple sensors used to detect rocket launches, like the network of blimps (photo). 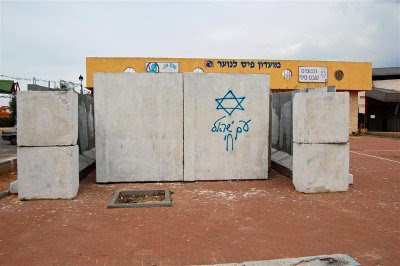 The warning is the two Hebrew words, "tzevah adom" - meaning "color red." The warning system and shelters have saved lives. 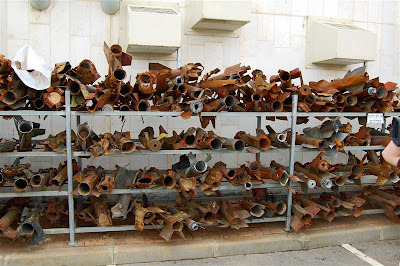 Schools have been protected by external steel roofs and awnings to prevent the ball bearings and nails packed as shrapnel in the rockets from penetrating classrooms. The last al-Qassam fired in this round struck Sderot a few hours after the unilateral Israeli ceasefire went into effect on January 18. Note the date on the rocket in the photo. It was fired to make a statement, a gesture. 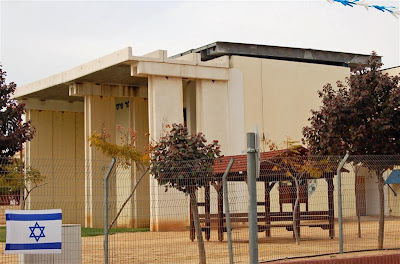 The al-Qassams that have hit Sderot are on display at the city police station. 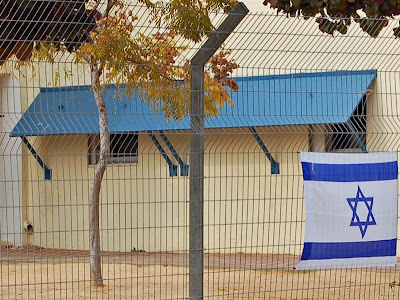 There is a new sense of patriotism and pride in Sderot as the rockets have stopped and the people believe that the Israeli armed forces have dealt a blow to Hamas. Hopefully it will last for some time. 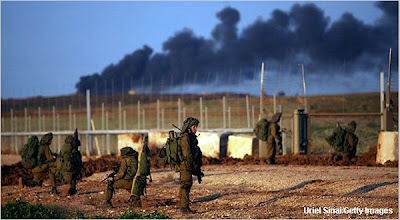 From mid-day on December 17, 2008 to the early hours of January 18, 2009, the Israel Defense Forces conducted Operation Cast Lead, a punishing air and ground action against Hamas in the Gaza Strip. 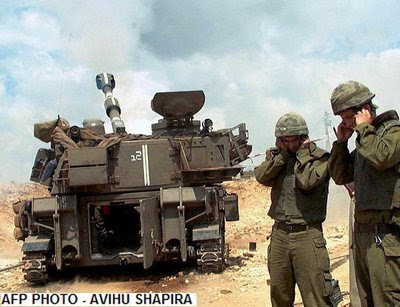 During the operation, approximately 1300 Palestinians died, as well as 13 Israelis (10 were IDF personnel). 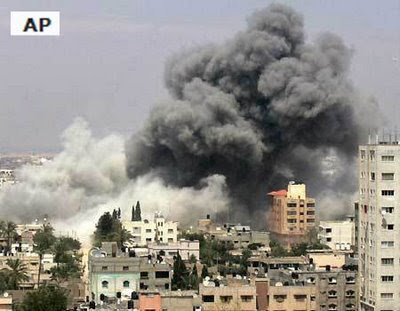 More than 5000 Palestinians and 500 Israelis were wounded. As with most IDF operations, Cast Lead was well-planned, well-executed and based on excellent intelligence. It consisted of distinct phases: a week-long air campaign, an initial ground incursion followed by penetration of urban areas of Gaza City. The following information was provided to me by Israeli defense sources during visits to Tel Aviv, Jerusalem and Gaza. The week long first phase of the operation was a stand-alone air campaign. Although the air defense environment was assessed as good, the pilots were ordered to make liberal use of infrared missile countermeasures - that means dropping a lot of flares. The first wave of attacks were timed to put about 70 fighter aircraft on target simultaneously at exactly 11:30am on Saturday, December 27. The initial sorties struck 120 targets. The remaining targets of the target bank were hit over the next week. The Israelis were very aware of the negative public opinion that would be mounted against them once pictures of bomb damage hit the airwaves all over the world. For the most part, they calculated that into the equation. They did try to minimize civilian casualties - phoning warnings to residents of buildings on the target list, employing only precision guided munitions and using an Israeli-developed small bomb. The small bomb, precision guided as well, carried only a 25-pound warhead. It was meant to kill the target and limit damage to surrounding residences. One objective of the air campaign was to decrease the number of rockets fired at cities in southern Israel. This objective was technically met - the numbers did decrease day by day, from more than 100 to less than 20. 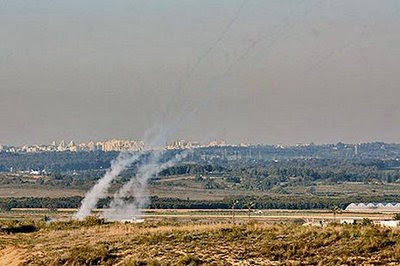 That said, despite relentless pounding by one of the world's best air forces, Hamas was still able to fire both al-Qassam and Grad rockets throughout the three week operation. 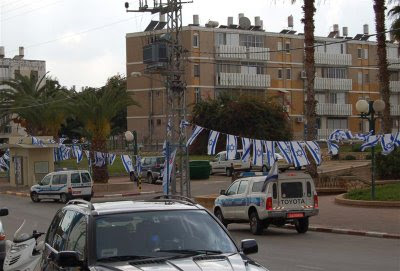 Targets included the cities of Sderot, Ashkelon, Kiryat Gat, Ashdod and Beersheba. After one week, the Israeli military leadership determined that the operation's overall objectives had not yet been met and that it was time to authorize the IDF to launch the ground campaign. Israeli air operations continued throughout the campaign. After the target bank was exhausted, pilots were directed to targets of opportunity by intelligence and surveillance system operators. The coverage of Gaza's skies was completely dominated by the Israeli Air Force. When I visited Gaza the day after the ceasefire was declared by Israel, there were numerous F-15 fighter jet sorties visible, as well as the nonstop buzz of unmanned aerial surveillance vehicles. The combat may be over in Gaza, but the war goes on. Now the battles are over the reconstruction projects that will repair the estimated $2 billion worth of damage to the infrastructure. As funds from wealthy Arab states - Saudi Arabia has pledged $1 billion and the other Gulf Arabs another $1 billion - become available, there is a coming struggle over who will administer the funds inside the Gaza Strip. The organization that controls the distribution of the money will garner important political clout and in essence emerge as the real winner of the war. As you might imagine, both Hamas and the Palestinian Authority (PA) want to be the manager of the funds and overseer of the projects. Israel would prefer that the PA be in charge - they have a good working relationship with Mahmud 'Abbas (Abu Mazin) - whereas they refuse to even talk to Hamas, considered by Israel, the United States and the European Union, as a terrorist organization. Israel does have a say in the reconstruction. Israel controls the crossings into Gaza except for the eight miles of the Gaza-Egypt border, the "Philadelphia Corridor." 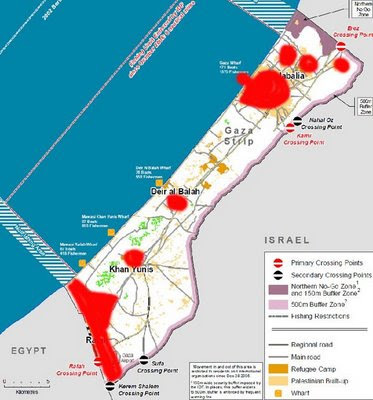 Most, if not all, of the aid will have to come through Israel - even if the Egyptian border crossings were opened, they cannot handle the volume of traffic that will be required to import the amount of building materials needed to reconstruct the Gaza Strip. Israeli officials have stated they want to make sure that Gaza is rebuilt, not Hamas's capabilities. Another Israeli concern is aid from Iran, which of course will be handled on the ground controlled by Hamas. Hamas has already started to pay out Iranian-supplied compensation to Palestinians whose homes were destroyed in the Israeli attacks over the last three weeks. This is yet another lesson learned from Hizballah. Immediately after the passage of a United Nations resolution ending the conflict between Israel and Hizballah in 2006, Hizballah teams in southern Lebanon began handing out Iranian-supplied money to people whose homes were damaged or destroyed. Hizballah then went on to re-arm and consolidate its political power, eventually emerging as the major power broker in the country. Hamas hopes to replicate Hizballah's success - turn a military defeat into a political victory. One way to do that is to control several billion dollars of aid. Administering aid also provides excellent cover for the covert acquisition of weapons to replace Hamas's depleted or destroyed stocks. Without gaining the position of aid administrators, the organization would appear to be just the defeated party in a war with Israel. If they are not involved in the solution, they will be blamed for all the damage and destruction. For the Palestinian Authority, administering the reconstruction aid may be its last chance for relevance in the Gaza Strip. Since its violent expulsion from the Strip at the hands of Hamas in 2007, the PA has virtually no presence or influence in Gaza, or as many Israeli officials refer to it, "Hamastan." If the PA can be seen as the rescuers of Gaza, it has a chance to regain some of its former political power. It will be difficult - the PA is notoriously corrupt. The coming fight between Hamas and the PA may rival their bloody fight in 2007 and the stakes are just as high. Israel annoucned a unilateral ceasefire effective at 2:00 am local time on Sunday for its forces in Gaza. Not long after that, there was at least one exchange of fire on the ground, a rocket attack on southern Israel and an Israeli response. It would appear that Foreign Minister Tzipi Livni prevailed at the late night cabinet meeting. She has for the last week or so proposed a unilateral ceasefire that did not require a Hamas agreement. Her rationale was that agreements only limit Israel since Hamas cannot be trusted to abide my any agreement. Hamas announced that they were not bound by the Israeli ceasefire declaration and repeated its earlier demands that Israeli troops withdraw from the Gaza Strip. 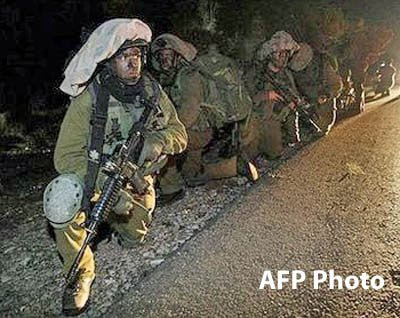 For the time being, Israeli troops are remaining in their positions. If the ceasefire does not hold - and the betting here in Israel is that it will not - what is the next move for the Israelis? Do they restart the offensive and push deeper into Gaza, including into the densely populated cities of Gaza and Rafah, as well as the Jabaliyah and Khan Yunis refugee camps? 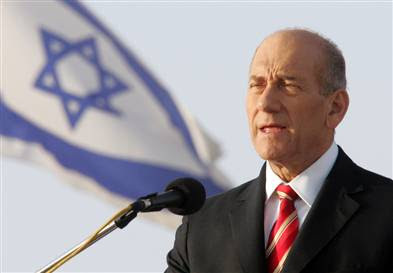 This has been Prime Minister Ehud Olmert's position - if Hamas does not abide by a ceasefire, the Israel Defense Force should be given free reign to hunt down the remaining members of Hamas and destroy the organization. Of course, this flies in the face of Olmert's claim when he announced the ceasefire that all of the objectives of the military operation have been met. Now the Israelis are in place in Gaza, not yet in an occupation mode, but it has the danger of turning into one unless they resolve the answers to a series of questions. No one in Israel, especially the IDF, wants a re-occupation of the Gaza Strip. Will Hamas be smart and sit tight until the Israelis feel confident that the ceasefire will hold and thus start the withdrawal of their forces? Will the Israelis begin to demobilize the reservists called up for duty in the operation? What happens if Hamas waits until then and resumes rocket attacks on southern Israel? All good questions, and not many answers. Welcome to Gaza. There is ongoing debate inside the senior Israeli leadership over what to do now in Gaza. The three leaders - Prime Minister Ehud Olmert, Defense Minister Ehud Barak and Foreign Minister Tzipi Livni - all have differing views on the best way to proceed. All seem to be in agreement that Israel has done about all the damage to Hamas necessary for a ceasefire, as long as it can get guarantees that Hamas will not be allowed to rearm. The debate comes at a time when we continue to hear optimistic (and seemingly unfounded) reports from Cairo that a ceasefire is at hand. Given what Hamas is demanding, it is unlikely that Israel will agree. If the Israelis do not believe the ceasefire gives them a victory, they will not go along. They will not repeat the perceived failure in Lebanon in 2006. 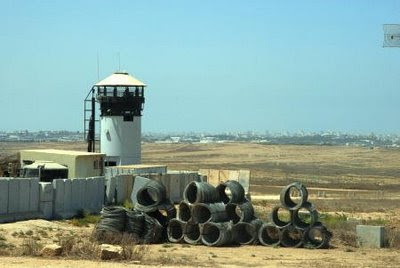 Some of the more outrageous Hamas conditions include a demand that Israel withdraw before a ceasefire takes effect, in other words, it is going to continue to attack Israeli troops in Gaza and Israeli citizens in southern Israel. Hamas also does not want a two-year truce, saying that is too long. That means the group believes it will be able to reconstitute itself sufficiently to resume attacks on Israel before two years has passed. There is also a proposal from Cairo for a ten-day ceasefire in place. The only party that will gain from that hiatus is Hamas. It will give the group a breather from the relentless nonstop Israeli assault. Israel cannot afford to have its troops sitting idle in the Gaza Strip for ten days. Many of them are reservists who are not at their jobs. As long as the army is perceived to be accomplishing the objectives, the Israeli people will support the operation. If the operation begins to take on the appearance of an occupation, it will dredge up memories of the past difficulties in Gaza. - Livni favors a unilateral withdrawal on Israel's terms with no ceasefire agreement. She believes agreements only limit Israel since Hamas will not live up to its commitments in any case. - Barak believes a ceasefire is necessary to provide the framework in which the international community will have a stake in preventing Hamas from rearming and continuing its attacks on southern Israel. - Olmert believes that if Israel cannot get a favorable ceasefire, the army should move deeper into Gaza's cities and camps and hunt down the remnants of Hamas. The winner: Tzipi Livni. The Israelis should declare their objectives met and begin to withdraw back to Israel proper. They should also warn Hamas that any resistance will be met with an overwhelming response. If Hamas continues to fire rockets or attack Israeli troops, then Israel will know its objectives have in fact not been met and resume the attack. Israeli forces have escalated the ground offensive by moving into parts of densely populated Gaza City - the city has already been tightly surrounded. This is the hardest phase of the offensive thus far. Until now, Israeli forces have been hitting Hamas targets from the air and moving into less densely-populated areas in an effort to stem the rocket launches into southern Israel. Hamas still shows remarkable resilience - now the Israeli infantry must go into the crowded cities to root them out street by street, alley by alley, house by house and often cellar by cellar. Hamas is using small teams to plant booby traps and set up ambushes in an attempt to replicate the determined defense of Hizballah in Lebanon in 2006. Israeli troops are responding by firing at anything suspicious, use overwhelming firepower (including tank and artillery fire), and blasting holes through walls to avoid some of the explosive devices. While the military confrontation is escalating and noncombatants (the Israelis use the term "uninvolved civilians") are being exposed to more firepower as the fighting moves to closer quarters, diplomats in Cairo continue to make optimistic statements that a ceasefire is at hand. Anyone watching the news or videos on the news websites would find such optimism hard to believe. In a positive sign, the Israeli lead negotiator returned to Cairo after going home empty handed last week. The Secretary General of the United Nations is traveling to the region to lend his gravitas to the negotiations. Despite diplomatic efforts, there is still a lot of space between the demands of Hamas and Israel. Unlike previous efforts, the Israelis will not halt their offensive while talks are ongoing. They will stop when the talks are successful. Otherwise, any halt in the momentum allows Hamas to regroup and try to rearm. Israel's strategy is quite clear - we'll continue to fight until one of two things happens - ceasefire talks are successful or ceasefire talks are no longer necessary. What will make ceasefire talks successful? For Israel it is the end of rocket attacks on southern Israel and guarantees that Hamas will not be permitted to smuggle weapons into Gaza. For Hamas, Israel must withdraw from Gaza and open the borders. Hamas can take no solace in Secretary of State nominee Hillary Clinton's remarks at her Senate confirmation hearings. She said that Hamas must renounce violence and recognize Israel. How the diplomats claim a ceasefire is in the offing is puzzling. What I see is continued Israeli operations in Gaza City to root out Hamas until such time as Hamas gives in or the rest of the world provides Israel the guarantees it requires. I hope Tony Blair knows something I don't. According to Middle East envoy Tony Blair, "the elements of an agreement for the immediate cease-fire are there." The former British prime minister hopes to see a cease fire in the coming days. 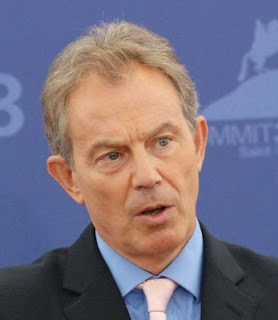 Blair is in Cairo in support of an Egyptian-French plan to end the violence in the neighboring Gaza Strip. That plan calls for an immediate cessation of hostilities on both sides and a commitment that Hamas and Israel will talk to each other about a lasting arrangement. Mr. Blair is confident, French President Nicholas Sarkozy is confident, and Egyptian President Husni Mubarak is confident. Unfortunately, none of these people speak for the combatants. Neither Hamas nor Israel has stated they are in agreement with the proposal. Israel has said will not talk to Hamas since it considers it a terrorist organization. For its part, Hamas has stated it will not agree to any ceasefire until Israel withdraws from the Gaza Strip. Israel will not withdraw until they are sure there will be no more rocket attacks on southern Israel. As I have said before - Catch 22. There is so much uncertainty with this proposal that I am at a loss as to why Tony Blair is so optimistic. As I said, the parties will not talk to each other. All the meetings in Cairo have been the Israelis with Egyptian general intelligence chief 'Umar Sulayman. Sulayman is a capable interlocutor with years of experience - he is the retired director of military intelligence. Even he cannot seem to find common ground between the two parties. The Israelis left Cairo with no progress, followed by Hamas leaders departing to meet with the Hamas political leadership in Damascus. Later, Hamas political leader Khalid Mish'al rejected the plan. One of the key sticking points is control of the border crossings and the requisite presence of international monitors to prevent rearming of Hamas. Those observers would probably be a United Nations force led by the Turks. That presence would have to operate in Gaza and Egypt, since Israel has refused to allow another UN force into Israel (with good reason). Hamas has rejected international observers in Gaza - that would prevent them from rearming, which is, of course, the purpose of the force. One proposal that would turn the Hamas-run border crossings over to Fatah, the rival Palestinian party that Hamas forcibly expelled from The Gaza Strip in 2007, is a non-starter. Given what is being reported from Cairo, Damascus, Tel Aviv and Gaza, I hope Tony Blair knows something I don't. Prospects for a ceasfire in the coming days appear dim. 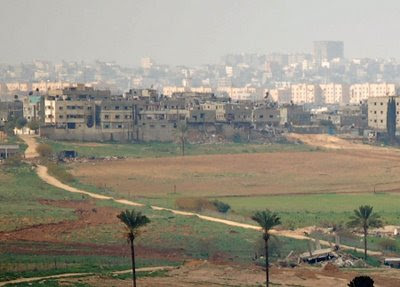 Israeli aircraft are dropping leaflets in the northern Gaza Strip, particularly targeting the sprawling Jabaliyah refugee camp that abuts the Hamas and Islamic Jihad rocket launch areas, and Gaza City itself. The leaflets warn the residents of an impending escalation in attacks on known Hamas militants and locations. There has been some press speculation that the next step in the Israeli ground campaign is to move into the cities in preparation for a re-occupation of the Gaza Strip. The Israelis left the Gaza Strip in 2005, hoping that the removal (forcibly at times) of the Israeli settlements and the departure of Israeli occupation forces who had been there since 1967, would lead to relative calm on their southern border. That turned out to be a miscalculation as Hamas almost immediately began attacks on Sderot. The Israeli occupation of Gaza was difficult and not something they want to repeat. I believe they have no intention of actually occupying the area, but have called up a large number of reservists to give them some options on how they proceed on the ground. 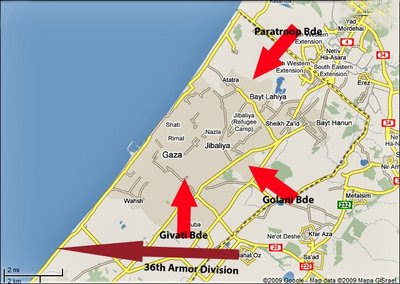 With this pool of troops, they will push further into the cities, starting with Gaza City and the Jabaliyah camp. The word "camp" is a misnomer - these are now cities, having been started in 1948. Moving through Jabaliyah and Gaza City will be tough urban warfare against a committed, wel-equipped and trained enemy who has had at least three years to plan and fortify their defenses. It will be bloody, and if the noncombatants want to not be "collateral damage," they should distance themselves from known members of Hamas and any location associated with Hamas. When the Israelis enter these areas, they will be ruthless in digging out the militants. That means lots of firepower in contained areas and close quarters. Once the Israelis decide to move, they will concentrate their efforts on those two areas first. The goal of the operation has always been to stop Hamas and Islamic Jihad from firing rockets at Israeli cities. Rooting out the militants from the "launch basket" should slow the pace of attacks if not eliminate it entirely. The timing of the leaflet warnings coincides with Hamas pulling out of the Egyptian-French sponsored indirect talks in Cairo. That may have been a fatal error for the terrorist group. I did note that the Hamas leader who vitriolically refused to participate in the Cairo talks lives safely in Damascus, not Gaza. There seems to be little chance of stopping an Israeli escalation and movement into the urban areas of the northern Gaza Strip. The Israelis have not been deterred by international (except the United States) condemnation and seem intent on achieving their aims. The Israelis do not want to re-occupy the Gaza Strip. However, they are serious about a secure southern border. If that means killing a lot of Hamas and Islamic Jihad terrorists, it's regrettable, but that's what they will do. Hopefully, the noncombatants will heed the leaflets. There was an expression during the heyday of the Roman Empire that all roads lead to Rome. Today, when speaking of terrorism in the Middle East, it seems that all roads lead to Damascus. Whether it be supplies from Iran bound for Islamic militants in Lebanon, Syria and Gaza, or a venue for meetings with senior terrorist officials, it all happens in Damascus. 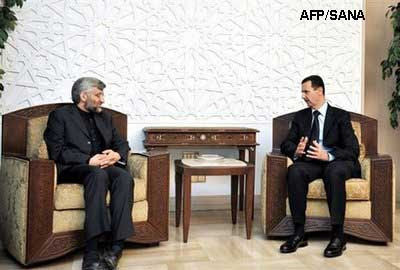 Only hours before the Israeli ground operation against Hamas in the Gaza Strip, the secretary of Iran's Supreme National Security Council, Said Jalili, flew to Damascus to meet with Syrian President Bashar al-Asad. While in the city, he also met with exiled Hamas political chief Khalid Mish'al and Palestinian Islamic Jihad leader Ramadan 'Abdullah Shalah. Both live in the Syrian capital with the permission and protection of the Asad regime. Virtually all of Hamas's and Islamic Jihad's funding, weapons and training originates in Iran and is funneled via Syria. It is not just Hamas and Islamic Jihad that draws Iranian leaders to Damascus. Last week, the speaker of the Iranian parliament, Ali Larijani, came to Damascus and met with Ahmad Jibril, leader of the Popular Front for the Liberation of Palestine-General Command, a group with American blood on its hands. Larijani also met with Khalid Mish'al and Ramadan Shalah. That's the second meeting in two weeks between these Hamas and Islamic Jihad leaders and senior Iranian officials. Jibril, like Mish'al and Shalah, lives in Damascus, also with the permission and protection of Bashar al-Asad. Jibril threatened to open another front against Israel - that would be from the north, from Lebanon. That sounds like it might be a problem for the Israelis, but in reality anything that happens in southern Lebanon happens with the express knowledge and consent of another of Iran's clients - Hizballah. 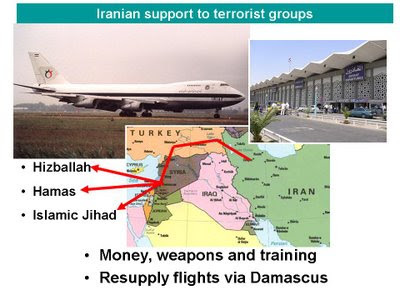 Hizballah is also supplied, funded and trained by Iran, via - you guessed it - Damascus. It is unlikely that Hizballah wants to provoke a confrontation with Israel, for several reasons. Hizballah emerged as a major power broker in Labanon following the war with Israel in 2006 - there is no reason to jeapardize that, especially given the mood in Israel now. Any Israeli operation against Hazballah will be much more effective than two years ago. I suspect that the few rockets that were fired from southern Lebanon into northern Israel were not fired by Hizballah, but by Palestinians from one of the refugee camps. Israel's operation against Hamas in the Gaza has stalled indirect talks between Damascus and Tel Aviv. If and when the talks resume, Israel will continue to make one of its key demands - that Syria stop allowing Iran to use Syrian airspace, airports, roads and border crossings with Lebanon to supply Palestinian and Lebanese militants. The battles may be taking place in the Gaza Strip, but the fuel for the fire originates in Iran, but it comes through Damascus. ...and no one listened? That is exactly what happened. The United Nations Security Council passed a resolution Thurdsay night calling for an immediate ceasefire between Hamas and Israel. Both sides ignored the resolution - Hamas fired 40 rockets into Israel on Friday, while Israeli fighter aircraft and attack helicopters concentrated on Hamas laedership and logistics targets. Neither side has shown any willingness to stop the hostilities. Israel believes it has a mandate from its population to achieve the two major aims of this campaign: stop Hamas from firing rockets into southern Israel and prevent Hamas from acquiring even more effective arms via sumggling tunnels under the border with Egypt. Hamas, for its part, believes - rightfully so - that it is winning the propaganda war. There are demonstrations not only in Arab and Muslim countries, but in many European countries as well. In most media outlets, Israel is portrayed as the aggressor, the military behemoth devastating an innocent civilian population that has no complicity in the attacks on Israel. The longer Hamas can survive the Israeli onslaught - and they are paying a high human price - the greater the public relations blow they are landing on Israel. The Israeli effort to minimize civilian casualties, often referred to as "collateral damage," has caused them some military difficulties. If they were to conduct their attacks with no concern for civilians, they may well have already achieved their objectives. It is this concern that has caused some media pundits to declare Hamas the victors, much like Hizballah was perceived to have fought the Israelis to a draw in Lebanon 2006. For example, Jackson Diehl, the deputy editorial page editor of the Washington Post, opened his recent analysis, "Israel's military campaign in the Gaza Strip is failing, but there may be a silver lining. The war against Hamas is proving -- once again -- that the Middle East's extremist movements cannot be eliminated by military means." Perhaps Mr. Diehl should stick to whatever his area of expertise might be; it certainly is not military analysis. You don't attack "movements" - you attack groups that espouse a movement, you attack targets. So, what of attacking Middle East extremist groups by military means. Has he heard of the Syrian charpter of the Muslim Brotherhood? How about al-Qai'dah in Iraq? Or the PKK in Turkey? In any case, the military operation is not over yet. Of course, the Washington Post wrote Iraq off as an Americna defeat in 2006. The United Nations resolution failed because it offered neither side anything it wanted or needed. A ceasefire in place would give Hamas time to regroup and rearm, while Israel would still control the flow of goods and fuel into the Gaza Strip. Bottom line: the Israeli campaign will end when Hamas agrees to stop firing rockets. At that point the United Nations can become relevant when it can provide an effective means of preventing Hamas from rearming. Until then, resolutions passed in New York without addressing the concerns of the combatants are only, as the Arabic colloquialism states, hibr 'ala waraq - ink on paper. As we move toward the inevitable ceasefire in Gaza, one of the key elements for the Israelis in any arrangement is the introduction of an international force to monitor and enforce the agreement. That international force will be charged with insuring that Hamas does not launch rockets into southern Israel, nor rearm itself via the porous Egyptian border. The Egyptian-French ceasefire proposal currently being talked about does not specifically address an international force - it only calls for a ceasefire followed by talks between Israel and Hamas. That may take some time - Israel still refuses to talk directly to Hamas, which it regards as a terrorist organization, and Hamas has not yet agreed to talks with a state they have vowed to destroy. That said, there will be a ceasefire. The question is how do we get there? Who gives in, what are the conditions, who monitors the agreement, etc. Israel will stop its operations only when it receives guarantees of a stop to Hamas rocket fire and the prevention of the resupply of Hamas. Hamas has thus far refused to allow any external observers, and claims it will only talk after Israel halts its operations. The classic Catch-22. Ultimately, we will get to the presence of an international force, most likely under United Nations auspices. That is how wars end in the Middle East. Most of these UN observer groups, the first of which was established in 1948, are still in place today. The fact that we keep having wars says something about the efficacy of the United Nations. There are reports that Turkey will be asked to organize the new force. The choice of Turkey is an excellent idea. Turkey is a unique country. It is a Muslim country, but not an Islamic country. The population is overwhelmingly Muslim, but there is religious tolerance - there are Jews and Christians in small numbers throughout the country. It is a secular state, and until the establishment of a democracy in Iraq, the only truly democratic country in the Muslim world. Yes, I am aware that Egypt and Syria have elections - no one actually believes there are truly representative governments. Turkey is also a member of the North Atlantic Treaty Organization (NATO), and is seeking membership in the European Union. It has one foot in Europe and the other in the Middle East. It's Muslim identity makes it acceptable to the Palestinians, even Hamas. The fact that it is not an Arab country makes it acceptable to the Israelis, not to mention the fact that Israel and Turkey have a longstanding military and intelligence relationship. The Turks area signing up for a thankless task. There will be times when Hamas attempts to rearm or fire rockets into Israel. Will the Turks fire on fellow Muslims? Will they strictly enforce the anti-smuggling protocols? If previous United Nations efforts are a judge, the answer is no - they will merely report the violations to New York. Thanks to the Turks for stepping up to the plate. Egyptian President Husni Mubarak and French President Sarkozy have proposed a ceasefire to end the current violence in the Gaza Strip. The proposal includes an immediate ceasefire to allow humanitarian aid into the area, followed by talks between Hamas and the Israelis to develop a permanent solution. The two presidents are well-meaning - it is a noble effort to try to end the hostilities that have killed over 600 Palestinians during the last 12 days. It is a difficult issue. On one side, you have a group of Islamic militants committed to the destruction of Israel, who have refused to stop firing rockets at Israeli cities. On the other side is one of the world's best-trained and equipped military powers intent on eliminating the threat to its citizens. Neither appears willing to give in - it is a recipe for disaster. France and Egypt are not the key players here - Hamas and Israel are. According to Sarkozy, Israel has "conditionally accepted" the proposal, while the Israeli media reports that Israeli leaders are "taking the proposal seriously." On the Hamas side, an official in Sarkozy's office reported that Syrian President Bashar al-Asad backs the proposal and that he will urge Hamas to stop firing rockets at Israel. Palestinian President Mahmud 'Abbas has agreed to the proposal, but there has not been a direct reponse from Hamas. Neither Asad nor 'Abbas speak for Hamas. According to the Egypt's ambassador to United Nations, representatives of Israel, the Palestinian Authority and Hamas have agreed to meet separately with Egyptian officials in Cairo. The Egyptian foreign minister was not so confident in this characterization, stating merely that Hamas had been invited to the talks. He also seemed to be downplaying expectations of the talks, now hoping for a "limited ceasefire" to allow humanitarian aid into Gaza - a far cry from the permanent ceasefore and Israeli withdrawal hinted at earlier in the week. There are several elements missing in the French-Egyptian proposal - all show stoppers. The most immediate is a provision in the plan that will prevent Hamas from firing rockets into Israel and prevents the group from rearming via the Egyptian border. The proposal, as I understand it, merely calls for a ceasefire, followed by talks between Hamas and Israel, not for the introduction of an international force to prevent arms smuggling and Hamas rocket attacks. "Talks" to Hamas normally means a breather during which it will try to regroup and rearm. In addition, Israel has stated that it will not negotiate with Hamas, which it considers a terrorist organization. The Cairo meetings may be the first steps in the ceasefire process, but I do not see the Israelis agreeing to stop their attacks unless there is a provision for a monitoring and enforcement mechanism, most likely an international force. Until Hamas agrees to that protocol, Israel will continue its actions in Gaza. International efforts to arrange a ceasefire in the Gaza Strip are taking place at a variety of venues, including the United Nations in New York. One of the provisions in almost every version of a proposed ceasefire agreement between Hamas and Israel is the presence of an international force of some kind deployed to the area to monitor and/or enforce any arrangement. 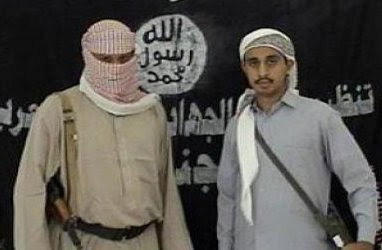 The composition and mission of that force will be key in getting both the Israelis and Hamas to agree to a ceasefire. Israel has stated that an international force is a requirement, and that it must be charged with preventing Hamas rocket attacks on southern Israel, as well as preventing Hamas from smuggling weapons via the tunnel-ridden Egyptian border. Hamas has not yet agreed to the presence of an international force in the Gaza Strip. It is hoped that Egypt might be able to convince the group that acceptance of such a force may be the only way to end the relentless attacks on the Palestinian territory. At some point, international pressure for a ceasefire will be so great that refusal to accept the presence of an international force will turn public opinion against Hamas. Continued refusal for such a presence will rob Hamas of its perceived moral high ground. Egypt would also have to agree to the presence of the international force since the tunnels are partly in Egyptian territory. What will constitute an acceptable international force? Will it be a civilian observer force, or a military force with a mandate to enforce ceasefire provisions? Unfortunately, any international force will likely have to be authorized by the United Nations. The United Nations has an abysmal record of conducting successful or effective observation operations in the Middle East. Look at the multiple "temporary" observer organizations already in existence in the Middle East - they have been there since the first war between the Arabs and the new state of Israel in 1948. There already are hundreds of military observers in Israel, Lebanon, Syria and Egypt - and they have yet to stop a war. The observer groups require large amounts of money and resources to sustain, and as far as I can tell, their only actual function is to perpetuate a rather comfortable existence. Israel must insist that any new UN force be mandated with not only observing Hamas trying to rearm itself and attempting to fire rockets at Israel, but that the force actually take preventive action. Merely reporting violations of the ceasefire agreement to New York is worthless - ask the Israelis on the Lebanese border. In an interesting turn of events, Palestinian President Mahmud 'Abbas will travel to New York to press the United Nations Security Council to adopt a resolution calling for an immediate end to Israeli military operations in the Gaza Strip and a permanent ceasefire between Hamas and Israel. That ceasefire will include an international observer force to monitor the border between Israel and the Gaza Strip. 'Abbas's proposed ceasefire raises a whole host of issues, not the least of which is his standing among the people of Gaza and Hamas, the democratically elected leadership of the Palestinian people. 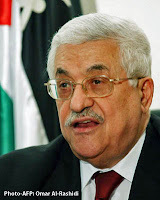 'Abbas was elected to the presidency of the Palestinian Authority in 2005; his current term ends on January 8, 2009. Hamas has said they will not recognize his authority after that date. 'Abbas may hold the title of President, but in reality, he exercises power only in the West Bank since his Fatah party was forcibly ousted from the Gaza Strip by Hamas militants in June 2007. That move in effect created two Palestinian states: a quasi-Islamic fundamentalist state in Gaza run by Hamas, and a secular state run by Fatah in the West Bank. Given that split and the animosity of Hamas towards 'Abbas and Fatah, why is 'Abbas pushing for a cease-fire that allows Hamas to continue its rule in the Gaza Strip? Perhaps 'Abbas realizes that unless Israeli troops completely annihilate Hamas - which is extremely unlikely - the Islamic group will emerge with much more domestic political capital than before the Israel military operation began. Conversely, Fatah has almost no chance of regaining a foothold in Gaza. If 'Abbas wants to retain any influence in the Palestinian leadership, he must have a political victory that benefits Hamas. Arranging a ceasefire that stops the killing in Gaza might do the trick. Some background is in order. Hamas, considered a terrorist organization by the United States and the European Union, was able to win the parliamentary elections in January 2006 not because people were enamored with Hamas, but because a majority of people were no longer willing to tolerate the corruption of the Fatah-dominated government. Under Hamas, however, things continued to deteriorate. Unemployment soared as the United States, Canada and the European Union stopped providing funds to the Palestine National Authority. Israel clamped down on the Gaza Strip, causing shortages and economic hardships. Hamas was able to claim that all the area's economic problems were caused by the Americans, Europeans and Israelis, deflecting scrutiny from their inability to govern and efforts to introduce more Islamic jurisprudence into the legal system. 'Abbas has his work cut out for him. He has to carefully craft a ceasefire resolution that is acceptable to the Security Council, a difficult task. Any condemnation of Israel in the resolution will surely be vetoed by the United States. If he is successful in New York, he will then have to sell it to Hamas who is on record as opposing any arrangement forced on them that includes international monitors. 'Abbas's proposed resolution just might be the answer, and will likely be acceptable to the Israelis. The question is - will it be acceptable to Hamas? Israeli forces in Gaza have thus far employed classic military strategy. Their initial thrusts into the densely populated Gaza Strip sought to isolate the northern city of Gaza and the sprawling Jabaliyah refugee camp from the rest of the territory. It is from the areas north, east and south of Gaza and Jabaliyah that Hamas fires rockets into southern Israel. Using these locations allows Hamas to maximize its reach into Israel. Hamas no longer has to rely on the short-range homemade and grossly inaccurate Qassam rockets. The Qassam could only reach Sderot, the Israeli city closest to the border with Gaza. 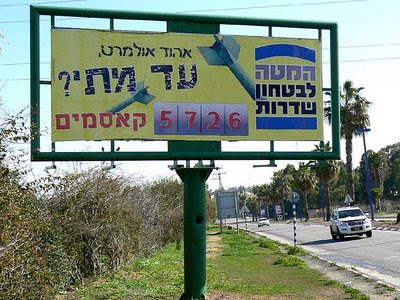 With its Iranian-supplied "Grad" rockets, Hamas can now strike as far north as the major Israeli port city of Ashdod, and as far east to Beersheba in the Negev desert. To hit these cities, Hamas must fire its rockets from the northeast corner of the Gaza Strip. That area is known in military parlance as the "launch basket" - noted in red on the map below. This launch basket - about 10 square miles of territory - was a priority target for the air campaign, and is a primary target for the Israeli ground forces entering Gaza. 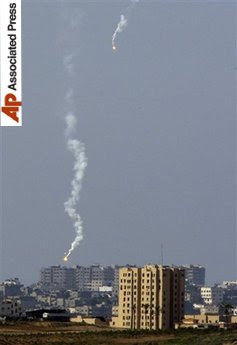 Israeli troops must clear and control the launch basket if they are to stop Hamas from firing rockets at Israeli cities. Almost one million Israelis live within rocket range of the launch basket. As of Sunday, Hamas was still able to fire rockets at Israel, despite Israel's claim that its forces control the northeastern section of the Gaza Strip. It's a big area and firing a small rocket that only requires a car battery can be hard to spot and stop. That said, this is the area that the Israeli forces must secure. Urban warfare against a committed and dug-in enemy who has had ample time to prepare defenses and obstacles is very difficult and can cost high casualties. The Israelis do not, or should not, have any desire to reoccupy the entire Gaza Strip. 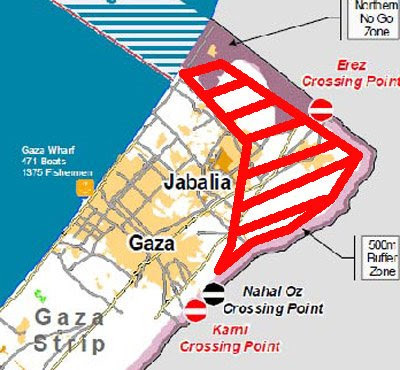 For now, they need to isolate Gaza city and the Jabaliyah refugee camp to prevent resupply and reinforcement from the southern Gaza Strip, but more importantly, they must clear and control the launch basket. The Israeli population is behind this operation. The Israeli political leadership needs to allow the Israeli military to do whatever it takes to prevent Hamas from firing rockets at Israel. Securing the launch basket in northeast Gaza is a good start. Now that Israeli forces have entered the Gaza Strip as the second phase of Operation Cast Lead proceeds, the world is demanding the United Nations arrange a ceasefire. UN Secretary General Ban Ki-moon expressed "disappointment" at the Israeli invasion - I don't recall such concern when hundreds of Qassam rockets were landing in Sderot, nor when Hamas upped the ante a few weeks ago by launching longer range Katyusha rockets at the cities of Ashkelon, Ashdod and Beersheba. Arab nations called on the UN to demand an immediate halt to Israeli military activities, while the French urged both sides return to the political track. In a bit of absurd theater, Hamas government spokesman Tahir Nunu stated, "Anyone who thinks that the change in the Palestinian arena can be achieved through jet fighters' bombs and tanks and without dialogue is mistaken." The question of whether or not bombs and tanks can change the situation remains to be seen. Nunu's remark about "without dialogue" is classic. Hamas does not recognize Israel's right to exist and has committed itself to the destruction of the Jewish state. Now he wants "dialogue" with the very same people he has vowed to destroy. The analyst in me believes that the bombs and tanks are indeed having an effect. If Hamas had the upper hand after eight days of Israeli air attacks, they would not utter the word "dialogue." For the sake of argument, let's assume that Hamas is serious about a dialogue with Israel. Israel has stated that it will not accept Hamas's word that it will not resume rocket and mortar attacks on southern Israel - any ceasefire must be accompanied with the deployment of international observers. Normally that means a United Nations observer force. If I were the Israelis, I would demand a totally independent group, not the same feckless and ineffective UN groups now deployed in Lebanon, Syria and Egypt. In reaction to the Israeli requirement for international observers, Nunu said that Hamas "would not allow Israel or the international community to impose any arrangement." Of course, that is exactly what his brother Arabs are demanding, that the United Nations impose an arrangement. What Nunu really means - Hamas wants the UN and international community to impose a ceasefire and withdrawal on Israel with no demands of Hamas and no deployment of observers that would limit their ability to continue launching rockets against Israel. Thus far, Israel has not let international pressure distract them from their operations, nor should they. There is no way Israel is going to win the public relations battle in the Middle East or Europe, so why even try? Urban warfare in Gaza is going to be difficult and bloody. Hamas learned valuable lessons from Hizballah's defense of southern Lebanon in 2006. No doubt it has created a series of obstacles, roadside bombs, and improvised explosive devices. Israel has calculated this into the decision to move into the Gaza Strip. This plan has been in the works for some time. I sense a determination on the part of the Israelis that was missing in 2006. They have mobilized tens of thousands of reservists in case Hizballah wants to join the fight and launch rockets into northern Israel from southern Lebanon, or Fatah wants to attempt to challenge the Israelis from the West Bank. I doubt either will make that mistake. The military option is not a solution, but it might remove one of the obstacles to peace - Hamas. Look for a ceasefire only when Israel believes that objective has been accomplished. 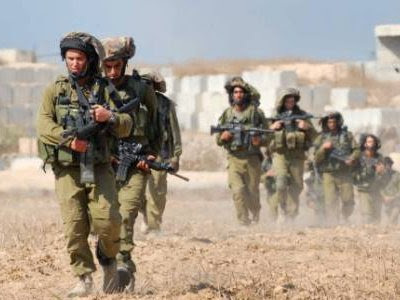 Israel continues to build up its ground forces on the borders of the Gaza Strip in preparation for a probable ground incursion into the Gaza Strip. The Israeli Air Force has effectively exhausted its preplanned campaign targets list, and is now striking targets of opportunity as they are identified by manned and unmanned surveillance aircraft. Israel likely has all the forces in place now for a ground operation in Gaza. One of two things will happen in the coming days. Either Hamas will offer a ceasefire that includes a commitment to cease rocket launches into southern Israel and a statement that recognizes Israel's right to exist, or the Israeli leadership will order the Israeli army to move into Gaza. That order, at the minimum, will be to eliminate Hamas's ability to fire rockets into Israel, or may go so far as to attempt to destroy Hamas. Barring Hamas's decision to come to terms with the Israelis - and I do not see that happening - the Israeli military will enter Gaza in force. As I have said before, the Israelis will not repeat the mistakes of 2006 when they did not use overwhelming force against Hizballah in Lebanon. That ill-fated decision by Ehud Olmert has resulted in a much stronger Hizballah. When Israeli troops enter Gaza, it will be with with tanks and infantry backed by artillery and aviation. 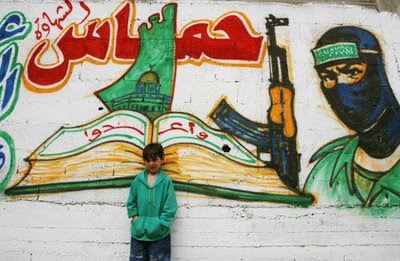 Hamas is not Hizballah - they may be as committed, but not as proficient. Israel has been cited by some misguided critics for use of what they label "disproportionate force" in Gaza. These critics do not understand military conflict. They would have you believe that if Hamas kills an Israeli, then the Israelis should kill one Hamas militant. That's not use of force, that's merely vengeance. If Hamas is systematically killing Israelis, the Israelis should use any force required to eliminate Hamas's capability to kill more Israelis. In military conflict, there is no such thing as disproportionate response. You use what you think you need to prevail and accomplish the objective. Just as Hamas is not Hizballah, Gaza is not southern Lebanon. The narrow Gaza Strip can easily be segmented by Israeli armored thrusts, possibly into as many as three sectors. Israeli forces could initially isolate the northeastern part of the Strip, in effect cutting off the city of Gaza and the sprawling Jabaliyah refugee camp. Israeli troops can move from Israel to the Mediterranean, a distance of less than five miles, and cut off this area. The area north, east and south of Jabaliyah are the "launch basket" for the Hamas rockets that have been used against Sderot, Ashkelon, Ashdod and Beersheba. The goal of the initial thrust will be to isolate the Gaza-Jabaliyah pocket from resupply and reinforcements from other area of the Strip. 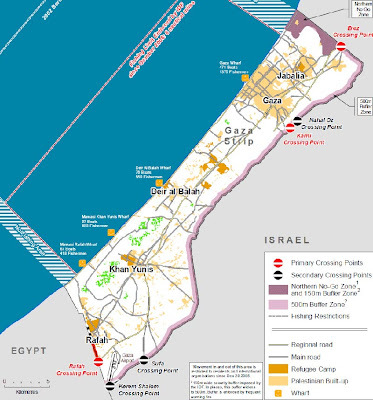 All of the weapons that enter Gaza do so via the porous border with Egypt into the Rafah area, and Islamic militant fighters are easily recruited amid the squalor of the Khan Yunis refugee camp. Separating the fighter pool and weapons supply route from the launch area should begin decreasing the number of rockets being fired into Israel. After the initial thrust, the Israelis should concentrate on two areas: clearing the "launch basket" around Jabaliyah and sealing the border with Egypt. Clearing the launch basket is obvious: closing the border with Egypt prevents the escape of Hamas leaders and the introduction of additional weapons into the Gaza Strip. This will not be easy. Hamas is a committed foe. Gaza is a densely populated urban area that will require difficult house-to-house urban warfare. The Israelis have probably determined that they have no choice - the time has come to address the issue of Hamas. It will not be long now. Israel, at least up until now, seems to have learned its lesson since its 2006 failure in Lebanon. At that time, the Israeli armed forces were not properly employed against Hizballah and were never able to stop the terrorist group from firing Iranian and Syrian supplied rockets into northern Israel. Hizballah was able to strike targets in and south of the major city of Haifa. The Israeli air campaign was fairly effective in stopping the longer range Zelzal rockets from being fired, thus protecting Tel Aviv from attack, but the shorter range Fajr rockets continued to rain down on Israel. By the time the order was given to begin a ground assault into Lebanon, Hizballah had time to reinforce its already prepared positions and slow the Israeli advance. By the time the two sides agreed to a ceasefire, Israel had gained the upper hand in the fight. Unfortunately for the Israelis, Hizballah had been bloodied but not defeated. Merely surviving the battle with the Israel Defense Force constituted a victory for Hizballah. In the aftermath of that conflict, Hizballah emerged as the major power broker in Lebanon. It was a poor showing for the Israeli political leadership and created a political debacle in Lebanon. Refusing a ceasefire that would only benefit Hamas was a smart thing to do. Continuing to pound Hamas's facilities, weapons caches, smuggling tunnels and leadership while moving troops to the border should send the signal that this is not Lebanon and this is not 2006. Hamas brought this on itself, and Israel will not stop until they achieve their objectives. 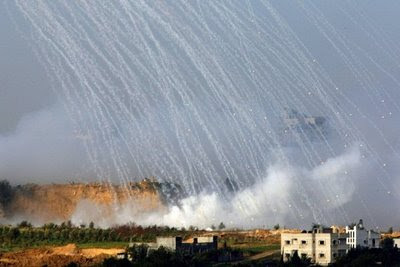 Many of the military analysts on the various American news networks criticized Israel's conduct of the campaign in 2006. In response, the Israelis invited several of us to visit Israel and talk to senior Israeli military and civilian leaders about the issue. Although most of them wanted to make the case that Iran is the major threat to Israeli state, they realized that their failure to deal a severe blow to Hizballah was a mistake. It appears that Israel has taken the criticisms and internal reviews of the action in 2006 to heart. They wisely have accepted the fact that world opinion will not be on their side and have largely ignored it. The Israel Defense Force has tried to make its case via press releases and has established a channel on the popular site YouTube. 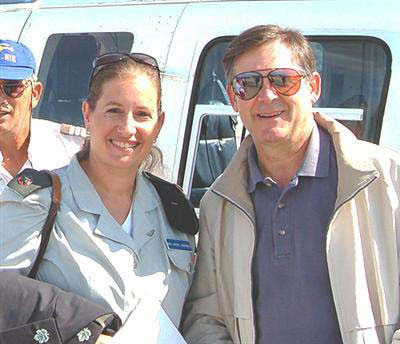 This effort is being managed by the IDF Spokesperson Unit headed by Major Avital Leibovitz (photo). The Israelis must be successful in Gaza to completely expunge the perceptions of their poor performance in Lebanon in 2006. Success at the minimum will be the elimination of Hamas's ability to launch rockets into Israel. If they can crush the Hamas leadership and force them into a surrender, so much the better. Only when Hamas either agrees that Israel has the right to exist or Hamas is destroyed can the peace process restart.